Rocking a 1940’s hair style on a daily basis, Miss Dale is known around her country town for her vintage style and for bringing other girls into the retro community in Port Macquarie. She started modelling when she was just a little lady. As a toddler she won a Big W competition and was hooked. But it was a retro styling workshop that saw Miss Dale transition into the world of pinup. And within months she was competing! Taking part in local competitions at first but then taking on Miss Pinup Australia! For the NSW final Miss Dale had to do five different costume changes, learn to pose, learn the etiquette and spend time with the other competitors. And it was worth it as she took out Miss Pinup Australia Miss Prestige NSW in 2013. That led to Miss Dale starting Velvet Rose’s Pinup Dressing room and helping other young ladies embrace their inner retro warrior. Miss Dale is now described fondly as a “pinup mum” and at the Port Macquarie Retrofest in 2016 was honoured by the ladies she helped enter the Miss Retrofest competition. But there is another side to Miss Dale Velvet Rose! She is just as comfortable under the hood of a car as she is on stage in a beautiful dress. Oh and she’s a drag racer! It was the first time she smelt burning rubber and was covered in the residue that she knew it was something she needed to do. So she signed up to learn how to drag race, has worked in pit crews and the rest they say is history! And if drag racing, mentoring and competing wasn’t enough Miss Dale has just opened the most amazing Vintage space in Port Macquarie. It’s a space for those with a passion for vintage to shop the look, for hair and makeup workshops and so much more! 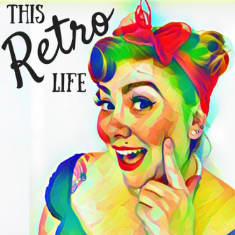 You can meet Miss Dale Velvet Rose and hear more about this incredible lady in episode seven of This Retro Life.